A delicious recipe for homemade banana flips. Two moist layers of banana cake with a fluffy banana cream filling. As much as I enjoyed the holidays (and the nice break) I have to say……I’m glad it’s all over. I’ve pushed all of those holiday flavors aside and I’ve moved on to banana! The other day I was lining up some recipes I wanted to make and share when I realized they were all banana! 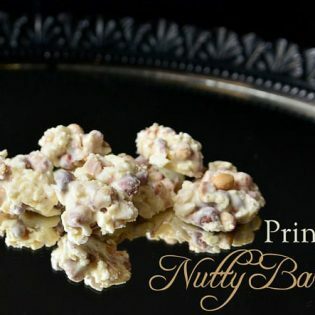 This recipe first caught my eye because of its simplicity then I realized it’s a copy cat recipe of an old time snack cake. I’d never heard of Banana Flips, but my husband sure had! His eyes lit up with excitement as he recalled the favorite snack cake from his childhood that he hadn’t thought about in years. I’m thinking anything filled with fluffy white cream around a yellow cake has GOT to be delicious! right? Banana Flips looked like a sponge-cake taco; a banana cake “shell” with creamy white fluffy banana filling. They were well known for their extreme messiness! I’m not a big fan of artificial banana flavor, but this moist yellow cake with a fluffy banana filling was light and sweet and only has a very faint banana flavor…….so faint in fact, that my hubby thought it could use a little more banana flavoring. So if you really want a punch of banana I would up the banana extract flavoring to 2 teaspoons in the recipe. But if you want just a hint of banana, leave it like it is! My husband said it was love at first bite……..they were everything he remembered in a banana flip, sans the taco shape. 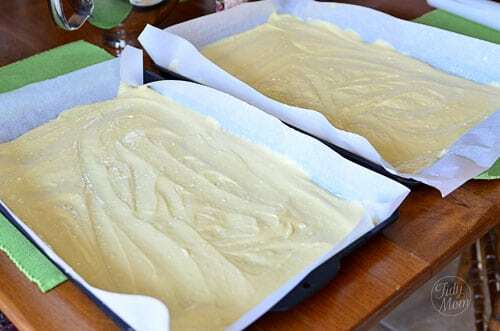 I thought about making these like whoopie pies, but since I only have one whoopie pie pan, that would have taken several batches, so for now, I opted for the layer cake and cut it into squares. 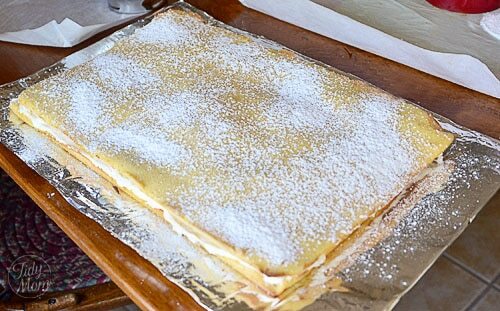 Using 2 jelly roll pans (any size, but the larger the pan, the more flips you will get. I used a half sheet pan) lightly grease pans, then line with parchment paper and grease parchment paper. Divide batter evenly between the two pans and use a rubber spatula to spread batter to edges of pans. Bake cakes in 350° oven for about 13-15 minutes. Cool completely. While cakes are baking, make banana filling. I also cut a large piece of cardboard and covered in foil to place my cooled cakes on (but you could probably just leave it in one of the pans). Place filling on one cake layer and using an offset spatula spread filling all the way to the edges. Carefully place second cake layer over frosting. Garnish with powdered sugar. Grease 2 jellyroll pans (11×17 or 10×15), then line with parchment paper and grease parchment paper. In a large bowl, stir together cake mix and instant pudding mix. Beat in the eggs and 1 1/2 cups of milk. Bake 13-15 mins. for 11×17 pan or 15-20 mins for 10×13 pan., or until a wooden toothpick comes out clean. Sift sugar and flour together in medium bowl and set aside. In a medium bowl cream together the butter and shortening until combined, then add sugar mixture. 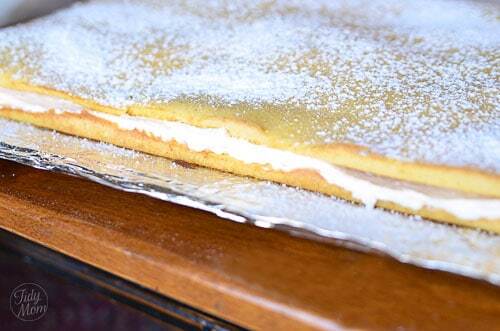 When cake is cooled, invert one layer onto serving tray. Spread filling over the top and cover with remaining cake layer. Garnish with powdered sugar. Keep chilled until 1/2 hour before serving. For more banana flavor, use 2 teaspoons banana extract. 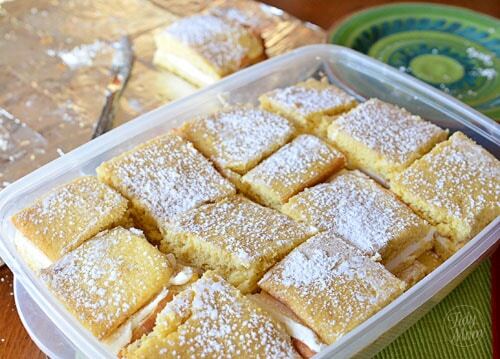 Variations you could also make these using whoopie pie pans instead of cake layers. 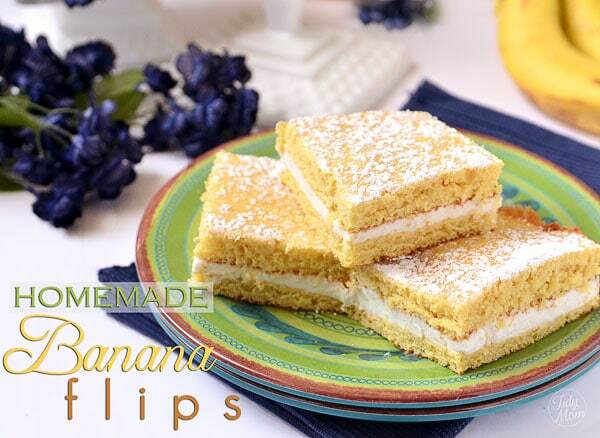 Like this Homemade Banana Flips Recipe? Pin IT! oh this sounds really good, perfect for a nice “light” treat for the new year. fun recipe! Hope you had a good new years! These sound so delicious. I had totally forgotten them as well! Cant wait to make them and share with friends and family!!! Sounds fabulous!! I love banana!! YUM!! These looks so good!!!! Never had or heard of them but I can’t wait to try!! These sound delightful. 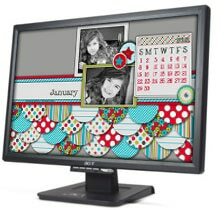 I love the bright new outlook as we head into 2012. Happy New Year! I have never heard of a “flip”. Thanks, Cheryl for introducting me to something new!!! I’ve never used parchment paper, though I’ve definitely heard of it. Is it available in the baking section of most grocery stores or is it special-order? I’ll check it out the next time I shop! Thanks, Cheryl. These look amazing, and I think that my banana-loving littles would love them. Dang it Cheryl! I am supposed to be eating healthy! But these look so yummy and I am a sucker for anything banana! Never heard of this cake but now I want to try it! Happy New Year! Bananas are one of my favorite fruits. I cannot wait to try this. I may consider adding a layer of Nutella! Thanks and Happy New Year. I hear you about banana. I’ve been eating apple bananas in Hawaii for the past few weeks and am totally obsessed! I had not heard of these before. They look so good! All the best to you and your family throughout 2012 Cheryl. Ive never seen or heard of banana flips until now. I need to get on these! Yum!! These look wonderful! I have been hoarding bananas lately, I have a few things I want to make with them too! I have not heard of these before, but they sure do look great! We all love bananas around here. Happy New Year, Cheryl! 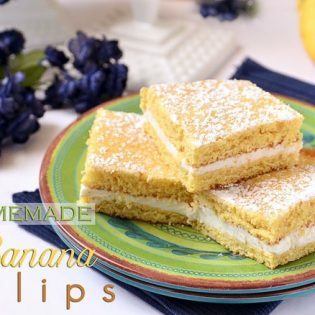 I’ve never heard of flips before, so nice you were able to recreate this childhood treat for your husband. Happy New Year! Oh me oh my! That fluffy cream! My husband seriously lurves himself some banana flips but I never buy them ha! He would go bananas (lol!!) over these! I’ve never heard of Banana Flips either and judging from the other comments we weren’t the only ones! Thank You! I will definitely making these for my 4&5 class for our church. These look fabulous! Happy New Year! OMG its look so cool so I am sure it taste also delicious. As I have never tried this but gonna do it anyhow coz banana is my achilles hill and anything with banana than…I just can’t hold myself. Anyway thanks a lot for this mouthwatering recipe. Oh my heavens…seriously delicious. Did you not get the cut down on the calories memo I sent out? ; D All the best to you in Cheryl in 2012! Oh my goodness! Sounds delicious! Thanks for the recipe. I am going to try it sometime this week. I have not had these in years and years! Banana Flips bring back some childhood memories. Thank you! This sounds like such a fun recipe…….Happy New Year! 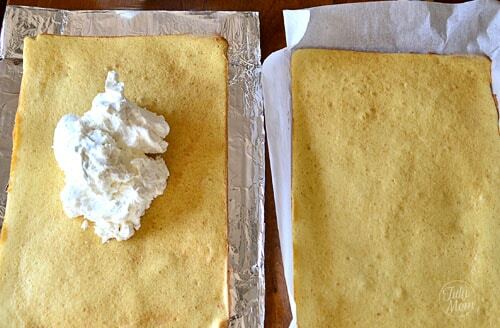 Oh my gosh, Cheryl… I can’t wait to make these. I don’t remember them as a kid, but would love to know them as an adult! I’m not a huge fan of banana myself but the guys love them ;D I can’t to surprise them with these this weekend. Happy New Year, Cheryl! These look to die for! This is going on my must make list! Thanks for sharing! Great blog. Hi Cheryl ~ Last night at dinner, only God may know why, my huband brought up Banana Flips out of nowhere. His eyes lit up when he talked about them, it was quite funny. Then I googled and found a picture of the packaging…. for him it was totally a moment to absorb memories from his past. Very fun to share that moment with him. I’ve never had nor heard of them. The great part is, his birthday is in 2 weeks and thanks to googling and finding your recipe, this will be his birthday cake surprise. I can’t wait. Thank you so much and I pinned this as well. Thanks again, blessing to you and your family!! Have a great day. OMG…. we used to eat Micky’s Banana Flips when I was a kid growing up in the Midwest. ** sigh ** Nostalgia! Okay, I’m a guy that likes to cook. This recipe seems the ingredients are all jumble together. What is the cake part? what is the filling part? I’ve seen many recipes, this is the first that doesn’t separate the sections. Is the banana pudding the only part for the filling? Why is pudding under the cake ingredients? Any help would be appreciated. You would have to be at least 50 to remember these snack cakes…..thank you for giving me back a piece of my childhood! Do you cook the filling with the flour in it? Why flour if it’s not cooked??? It sounds really good! My husband loved those things and asks for them all the time.